This section is dedicated to the XXth century naval battles, with an introduction to naval warfare since the bronze Age. Naval Warfare is as old as there was a recorded history. At least, the Battle of the Nile Delta (between Egypt and the Sea Peoples) is the oldest from which we have a detailed depiction, circa 1175 BCE. Naval warfare was endemic in the Antiquity, this closed sea being surrounded by Empires, kingdoms and trading cities or colonies. Galleys were the norm, from the lightest Moneres (Greek) with a few rowers to the classic Triakonteros (30) and Pentakonteros (50) rowers which were the staple of the bronze age naval empire, like the Minoans, Cretans and Mycenians, or the Phoenicians. Following the Greek classical age (700-300bc), this was the advent of new “double row” ships, like the Dieres (2 ranks) and Trieres (3 ranks), even faster and larger, with platforms for marine troops. However the main tactics of the day was ramming, tactics which were much refined into battle formations for defensive and offensive actions as well. Typical Greek Athenian Triere reconstruction of the 1970s (Olympias). Around 400bc a whole range of new, more massive galleys made their appearance, like the Penteres (“5 ranks”, in reality 5 rowers on three ranks), Hepteres (7), or Deceres (10) which served as flagships. Multiple rowers also gave smaller ships, not less interesting: The Tricontheros, Hemioliae, Lemboi… With the Hellenistic age, new hyper-galleys appeared, with large platforms for hundreds of marines and siege engines, 14, 20, or even 30 and a single 40 (Tesserakonteros) in the Ptolemaic navy, probably a twin-hull ship designed more as a floating prestige item than for battle. New kids on the blocks around 200 bc the Romans had to deal with the powerful Carthaginian fleet, and devised their own mass-produced galleys like their opponent did with prefabricated parts (as we discovered recently). But they soon also devised a new way to deal with the Greek-style, fast Punic ships as well described by Polybius: Heavy galleys (estimated “5”, “6” or more) with full battle decc bristling with onagers, catapults, ballistae -launching the famous harpago designed to “catch” enemy ships- and the corvus, an assault ramp. With these heavy, slow ships the Romans inflicted crushing defeats to the Carthaginian at sea, ending the 1st Punic war by an adaptation of their skills as a foot army at sea. After the fall the of the last Great Hellenistic naval power of the era, the Ptolemaic navy (Battle of Actium, 63 bc) the Mediterranean became a “Roman lake” almost until the fall of the Byzantine empire in 1453, with the only episodes of the pirates fleets (dealt by the young Pompey the Great) and in the christian era, the threat of the Vandal fleet. Two worlds, two ways to building ships and wage warfare existed up to the Renaissance. In the Mediterranean, just like for the antiquity, galleys ruled the sea; This was especially true with the byzantines, that perfected the Roman galley (Dromon, Khelandion…) derived into a large variety of ships, fast, well armed and equipped with “castles” but most of all the famous “greek fire”, an ancient flamethrower. Sailing roundships also existed, as mixed commerce/war vessels, called “navas”. Inn the North, sturdier Celtic ships were son mixed with Nordic influence in shipbuilding, no less than the excellent “langdskips”, the mixed rowing/sail symmetrical ships masterfully built in Scandinavia, that also bring with it the much feared Viking raiders and many changes they bring in Northern and Eastern Europe (Rus), before coming into the Mediterranean through the Normans. A fascinating subject that would require a whole chapter of its own, it just worth mentioning its huge influence in Shipbuilding in this part of the hemisphere. Medieval naval Warfare relied on close combat, ship-to-ship boarding, with preliminary arrow and javelin exchanges. The great revolution that bring this era was of course gunpowder. It soon made its way from land to sea, as the first ships saw their hulls and castles soon bristling with a whole array of firearms, from massive siege cannons low in the hull, to smaller couleuvrines, serpentines, arquebus, ancestors of light guns. 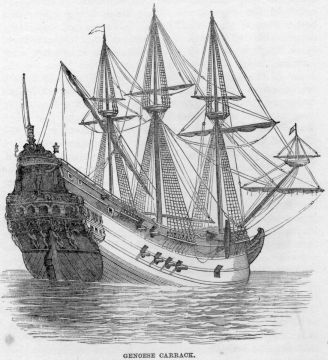 The biggest warships of the day were the military ones, the carracks (later replaced by faster, latin-influenced galleons). With their wide square sails, five masts, high castles, and massive crew, these slow ships, prestige ships were also aligned by the great naval powers of the North in a naval race (Great Britain’s Henry VII vs. France’s king Francis the 1st) but the Spaniards and Portuguese in what became soon an empire-building game. In the Mediterranean, independent city-states of Italy still relied on galley as well for trade and war (this time with guns), going as far as designing powerful hybrids like the Galeasses which almost won the day at the battle of Lepanto (1571). We can’t also not mention in 1690 the famous naval battle that opposed a dwarfed British fleet to the mighty “invincible armada” or King Philip II. Already a century before there was new kid on the block, the Dutch navy also built its own colonial empire, whereas older empires like the Portuguese and Spaniards, although dominating the South Atlantic (since the papal treaty of Tordesillas) went far in Asia (Japan was under Portuguese influence), but the century or enlightment also achieved this world’s “discovery” by the European, soon roaming throughout the pacific, comprehensively completing the last blank areas of naval maps. The world became smaller. An the first “world war” began as the seven years war in 1756–1763, born in Europe from extreme tension between powers of the age and through the seas, in almost every continent, North America comprised. Russia also entered this club under Peter the Great, an enterprise consolidated later by Catherine the Great, fighting Sweden in the Baltic, using ships remarkably similar to Mediterranean galleys (in fact built by Genoans) whereas Sweden devised its own hybrids designed by mathematician and engineer Chapman. What was like to be in a naval battle these days? -First off, there were still no obvious difference between some warships and civilian ones, as they shared the same rigging and displayed false gun ports in order to dissuade pirates and corsairs that roamed unchallenged in some areas, in the Caribbeans in particular. -Wooden shipbuilding after hundred of years had reached a certain level of maturity, which started with state-management of forests. The biggest were the ships of the line, purely military ships literally bristling with rows of massive guns, on two, three, even four decks. HMS Victory at Portsmouth, 1900. Now preserved, this is the sole surviving example today of a 1st rank ship of the line typical from the XVIIIth Century. -Powered by sails only, which were at that time refined, complicated yet flexible wind-trapping structures requiring a massive manpower, their only tactic was to close-in at less than 100 yards (since muzzle-loaded guns with round shots were pretty inaccurate) to hammer the enemy ship flanks and rigging by coordinated volleys, maneuvering to present the other side or try to destroy the enemy’s rudder, masts and sails, then close-in again for boarding. -Ships-of-the-line were classed by number of guns (like the French ’74 canons’) or simply by rate (1st to fifth in the British Royal Navy). -Frigates (the ancestors of the cruisers) were seen as faster three gun-deck ships, with more sails but less guns (or lighter ones), for screening, reconnaissance, dispatch or showing the flag in distant, colonial areas. -Lighter still, were the Corvettes, two gun-deck ships, and one deck only Bricks which had a simplified rigging. Very fast and even smaller Cutters were often used by corsairs. Single-masted their rigging was efficient, simple, but huge compared to the hull. These ships were still used in the beginning of the XXth century as harbour pilots. Last chapter in this overview were the first steamships, which appeared through experiments from Fulton (he was preceded by a wave of scientists going back to the XVIIth). This coincided with the Napoleonic era which saw again epic naval battles (Trafalgar and Aboukir), with the same kind of ships that sailed in the 1750s. Fleets entered a relatively conservative path until the first military steamships came along in the 1830s. Light, only equipped with a few guns, these had paddle wheels, convenient at that time for civilian service but quite easy to destroy in times of war. 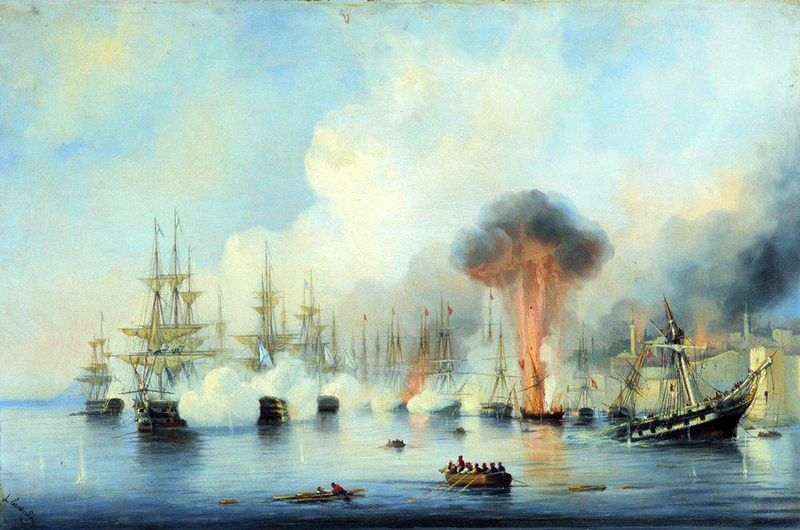 Battle of Sinope (1853) : The whole Turkish fleet is destroyed by the Russians, using for the first time Paixhans bombs. They were used for dispatch, supply, an patrol. But this was the arrival of the screw propeller (Archimedes, 1839, Great Britain, 1845) that new horizons were soon to emerge for the navy. In 1850 the french launched the first mixed ship of the line, propelled by screw, the well-named “Napoleon”. Soon after the British ad French went together to war against Russia (which before has devastated the Turkish fleet at Sinope using Paixhans bombs instead of the usual lead balls), and if the Napoleon showed its usefulness, specially-crafted armoured (although wooden) floating batteries were devised to deal with the Russian forts. From 1861 to 1865 on the other continent, the North and South will collide, with unequal forces on sea and rivers (like the Mississippi), as the North was by far the dominant industrial powerhouse of the two. So much so that the Union navy quickly set in place a naval blockade against the “rebels” which devised not only a fleet of converted raiders but also the first steam-only ironclad, the CSS Merrimack. This famous ships was soon opposed to the no less innovative USS Monitor designed by John Erickson. The latter was indeed equipped with two guns only but in a fully revolving turret. Although their Homeric fight at Hampton roads ended as a draw, they showed the way for future ships named after this first pioneer, “monitor”. On the other side of the Atlantic, in 1860, the french launched “la Gloire” a simple wooden frigate, which walls were entirely covered by armoured plates. This was the first sea-going ironclad. The next year the British navy received its first ironclad, the warrior, that pushed the boundary even further by choosing an all-steel hull. Naval rivarly between these two countries gradually declined before the emergence of new industrial powers and new navies, the American, Italian, German, and Japanese fleets that entered the fray in the late 1890s. Outside the battle of Lissa (between Austrian and Italians) in 1866, Yalu (1895 between Japanese and Chinese) or the battle of Manila bay and Cuba in 1898 (between US and Spanish ships), there were few large scale ironclad battles to notice. Gradually by the 1870s ships transitioned to sailing only, rows of guns were replaced by traverse-capable guns in barbettes, then turrets, masts being stripped of their sails and kept for signals, observation and at the beginning of the XXth, wireless communication. The last “classic” battle of the era (before the great war) was Tsushima. The battle of Tsushima: Admiral togo on the bridge of flagship Mikasa. The Japanese Navy (teached and equipped by the Royal Navy) vanquished the Russian bear by masterfully executing classic and new naval tactics combined. At that stage many revolutions already occurred. First, with the introduction of breech-loading guns (which were faster and safer to reload, required less space and therefore authorized longer, heavier barrels), with the arrival of rifled guns (which increased both range and accuracy), and shells (which replaced cast iron spherical grenades, again much more accurate and able to pierce through armour). Naval engagement range therefore grew in spectacular proportions, from a mere 200 yards to one kilometers (at Yalu, already two kilometers), to even three (at Tsushima). This was only the beginning of long-range artillery duels. Outside this, both the torpedo (and Austrian invention from 1870) and the mine made their appearance as well as early (mostly experimental) submarines. In this area, things became interesting as most fleet had already tested submarines and building entire classes by 1910, and the torpedo boat, well helped by turbine engines (parsons) were fit to carry these new torpedoes. Immediately to counter these, TBDs (soon called simply “destroyers” were devised), whereas speed of battleships and cruisers was largely improved by the adoption of triple expansion engine (although still devouring large quantities of space-consuming coal). These lumbering beasts (15-18 knots at best), although capable of shelling targets at ten miles, as well as dealing at the same time with much faster cruisers or even smaller TBs, were still betrayed very far away by their thick, black, tall plume of smoke. Things will change again, before the Great War with the introduction of the Dreadnought and later, the Battle cruiser. But this is another story. 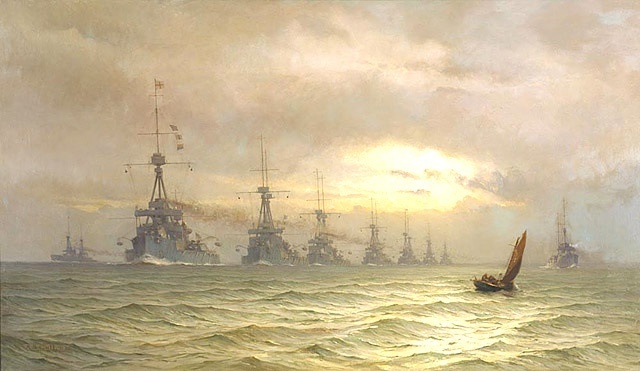 The Grand Fleet 1st naval squadron in 1910.